What color is your filling? Dental fillings can be made of numerous materials. The most common are 1) composite or tooth colored fillings, and 2) amalgam or metal fillings. What is the difference between the two? Dr. Ross, a Loveland, CO DDS explains the difference between the two fillings. There is a lot of controversy surrounding amalgam or metal fillings. Amalgam fillings are made up of a mixture of mercury, silver, tin, copper, and other trace metals. The amalgam comes in little capsules that contain liquid mercury and powdered silver, tin, copper and the other trace materials. Before a filling is placed, this material is shaken up in a chair-side machine which allows it to form a durable substance that can be molded into the tooth. Once it is in the tooth, it will set up into a hard structure that is the filling. The mercury in amalgam is what bonds the other materials together. 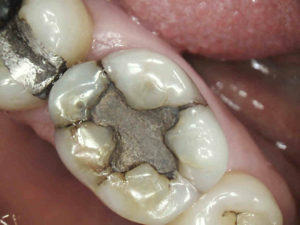 Amalgam has been used as a filling material for years; it appears to have been used in the United States dating back to 1844. The reason amalgam is used in the dental field is because it is long-lasting, it is the least expensive filling material, and it is not as sensitive to saliva as composite fillings. There is a lot of controversy surrounding amalgam fillings due to the fact that it contains mercury. There are many websites out there that claim that the mercury in amalgam will cause health concerns and fetus defects. However, none of those health concerns or fetus defects have been proven. Some studies have shown that the peak level of exposure to the mercury contained in amalgam occurs when a filling is placed and removed. If you have amalgam in your mouth and the filling is intact with no dental caries present, then it is recommended that you leave it. Some of the reasons are as follows: removing the filling might cause unnecessary exposure to the mercury vapors; removing the filling might result in the removal of a healthy tooth; and removal of the filling might cause unnecessary irritation to the nerve of the tooth. However, if you have metal allergies to copper, tin, and silver then it may be necessary to have another type of filling placed like composite. 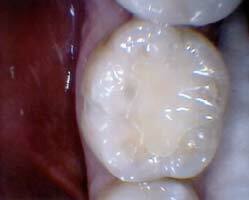 Amalgam is a very durable filling material. It has been used in millions of people without problems, and it works well and lasts a long time. 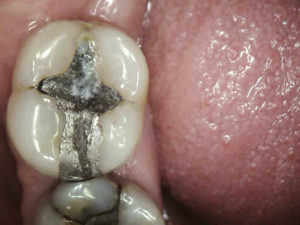 That being said, amalgam is a metal filling. Like most metals, it will expand and contract with thermal changes, and over time, it’s possible to place crack lines in the tooth. When placing the amalgam in the tooth, the Dentist also will need to make undercuts that allow the amalgam to stay in the tooth, which sometimes removes more tooth structure. This amalgam filling is in the occlusal part of the tooth. This amalgam filling is in the Mesial Occlusal part of the tooth. Composite dental fillings have recently been made to be just as durable as amalgam. 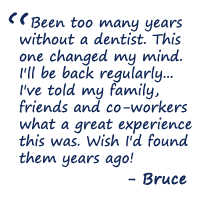 Composite is made up of synthetic resins. Composite has been used in the dental field because it is insoluble, aesthetic, insensitive to dehydration, malleable, and it bonds the tooth together. Composite is slightly more expensive than amalgam, but it is still relatively inexpensive compared to many other dental materials. Composite comes in many forms of application, but it is used with etch to open the pores of the tooth, with bond to allow the composite to adhere to the tooth, and with a light polymerization to harden the material. 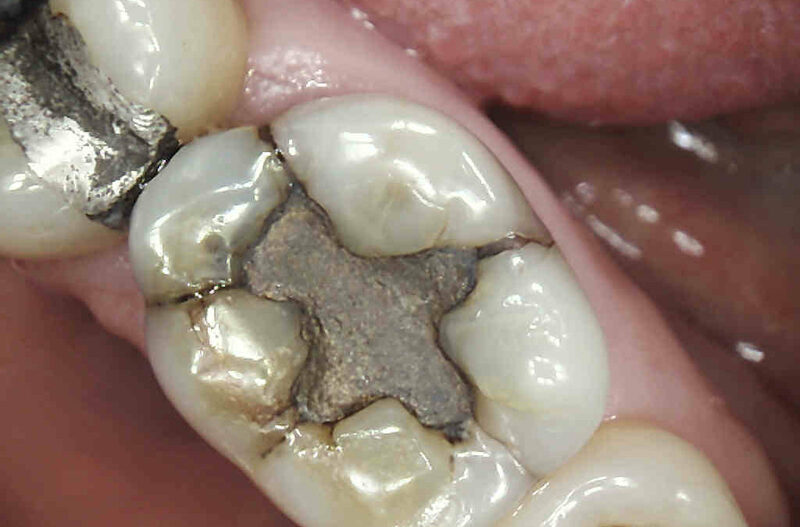 Composite material can be more conservative than amalgam, due to the bonding it relies on. When bonding the filling to the tooth, the tooth and area surrounding the tooth does need to be dry however. Composite material is tooth colored and comes in many different shades; therefore it is more pleasing aesthetically. Also with composite material it can bond to itself. Depending on how the previous composite filling chipped, it can be repaired by bonding additional composite to the chipped filling, whereas an amalgam chipped filling will more than likely need to be completely replaced. Composite does not contain metal so it does not expand and contract like amalgam, and it can bond micro cracks in the tooth together to possibly give the tooth the best chance of not fracturing. However, during the light polymerization or hardening of the material, there have been studies that have shown that it can cause micro shrinkage. However, over the course of developing composite, scientists have reduced that shrinkage significantly. 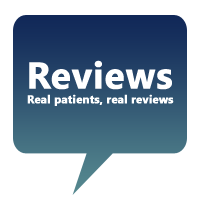 There are many different dental restorations options. Each person is different, and just because one option was good for your friend, it does not mean that same option is what’s best for you and your mouth. Each person has different eating habits, grinding habits, and oral care habits. It is always best to ask and listen to your Dentist. 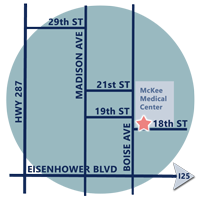 If you ever have any questions, Ross Family Dentistry is always here to help and discuss all of your options!